The Nightmare Before Christmas is a classic Halloween movie – or is it Christmas? In any case, Jack the Skeleton is a staple character for the spooky season. 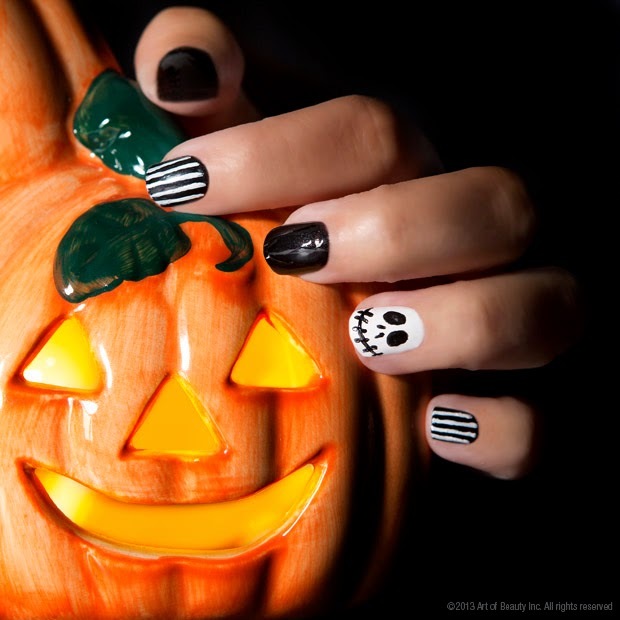 Here’s a great Halloween-inspired nail look to try using Zoya Nail Polish! Step 1: Prep nails using Zoya Remove + and apply Anchor Base Coat. Step 2: Paint all nails except one accent nail using Zoya Raven. Use Zoya in Purity for the accent nail. Step 3: Choose which nails you want to stripe. Once the base is completely dry, take a thin striping brush and create 4-5 thin lines vertically down the nail with Zoya Nail Polish in Purity. Step 4: For Jack’s face: Create two dots for the eyes using a dotting tool and drag down a bit to make them large ovals. Create two small lines for the nostrils. Next, draw a smile line from one edge of the nail to the other. Finally, make vertical lines on the mouth for the stitches. Step 5: Once your accent nails are mostly dry, seal in your festive new look with Zoya Armor Top Coat!